It is with great sadness that i have decided to list my very pretty old doll,she was purchased about a year ago, along with another 3 dolls,i believe all of the dolls may have came from the same home,im not usually a doll person to be honest,but whilst visiting the local charity shop near our old home i spotted both her and the other 3 dolls together on a shelf,i have no idea what made me go over and have a look at them but i just felt i must ,as there was something captivating about them and the way they looked,i purchased all the dolls,took them home and thought i would see if my teenage daughter would like them for her room,however my daughter wasnt keen at all so i placed them on to a shelf in my bedroom,from that very first night i had strange dreams in which the dolls would appear speaking(well more like rambling very fast ) and saying names, the names Katherine and kathlene were repeated with this one,although i thought this odd, it wasnt untill i noticed the dolls had changed positions on several occasions that i began to think there was something rather strange and began thinking about spirit attachment,gradually more strange things have happened ,from items being knocked off the shelf the dolls were sitting on in the middle of the night,my daughter hearing little girls giggling and wispering everytime she is alone upstairs and myself and others hearing the sound of childrens footsteps running along the landing late at night,i have tried to get my head round things and think of other possibilities however there have been too many strange things happen for me now not to believe the dolls are haunted,to be honest i myself am not scared in any way,as i dont believe there is anything bad about any of my dolls(i will also be listing the other dolls i have very soon) but my daughter is terrified and wont sleep or go upstairs alone anymore without having the house lit up like the 4th of july! so im afraid i must find someone who knows a bit more about this sort of thing to give them all a good home,maybe someone who reads this will feel or be able to get in touch with any vibes or info regarding this beautiful girl as i can only tell you what i know has happened since we have had her in our home,by law i must state that calling/classing something as haunted must be for entertainment purposes only,i cannot be held responsible for what does/does not happen,any buyer/bidders must be over the age of 18 please note this before bidding. What people say to sell items these days is beyond me however the doll haunted or not was what I was looking for so I decided to put a bid on and this morning I was surprised to see I had won the doll. I contacted the seller to see if I could get some more info about the history of this doll with intent of publishing the story on my website. She sent me quite a lengthy email which is quite creepy to read of which I will publish on my website as I am going to open a case file on this as its too amazing to ignore.Basically she bought the dolls and did not understand why as she has had no interest in dolls but was attracted to these. It started with her dolls invading her dreams and has advanced to her daughter hearing giggling and whispering to humming and laughing and finally to things changing positions on shelves where the dolls were and items falling off. Also kettle would switch on and off, lights flickering and daughters television would keep needing retuning. Plus since listing the dolls lots of odd things have multiplied. Weird thing is the photos are dated a year ago and the seller has moved house but the disturbances have followed her so it looks like the spirits may be attached to the dolls not the house. Things I have noticed since obtaining doll is strange drafts around the face as if someone is blowing on you. K2 meter positioned next to Kathleen turned itself off by itself. Thought Batteries had died but when switched back on it lasted for ages. Also took photo of Kathleen sitting in chair next to me photos show 11/2 gap between shoes but when I looked back at her moments later shoes were together. I am sure I did not touch the doll and her legs do not spring shut you have to push them to close them. I am sure by the way the seller contacted me that she really has something going on here and seems to be letting the dolls go far too cheap than other sellers as if she has got to sell them for her daughters sake who fears them greatly. Having a bath at home about 12.45pm today and suddenly heard lots of bumping around which sounded like coming from above upstairs. Quickly got dried and with a towel around me rushed upstairs to see what was going on but found nothing, no objects fallen everything seemed to be in place. The noises stopped as soon as I opened the bathroom door. No one else indoors at time. The bumping volume was loud and quite honestly I could not get out of the bath quick enough to go and investigate. The doll was upstairs in the bedroom at the time. When I took the doll to work to show the guy I work with a colleagues computer malfunctioned, took him nearly 4 hours to sort it out. A contractor who came in to pat test a fuseboard meters packed up and someone else in the office dropped his iPhone down the toilet. I sent a picture of the doll to my parents and my email program froze and needed a reboot to cure the problem but second time lucky they finally received it. I telephoned my parents today only to find their television went out of tune and had to be retuned in a couple of times. The woman who sold the doll said her computer went funny when sending emails about the sale of the dolls and she also said her daughters television kept going out of tune. "I never want to try and make contact with anything in my own home as do I really want to live with it 24/7 365 days a year"
In other words never investigate or bring something into your own house and I was breaking this golden rule. 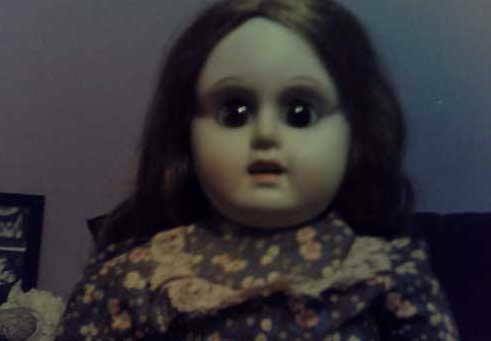 The Doll has now gone and I have since not noticed anything odd happening in my home since and thats the way I want it.